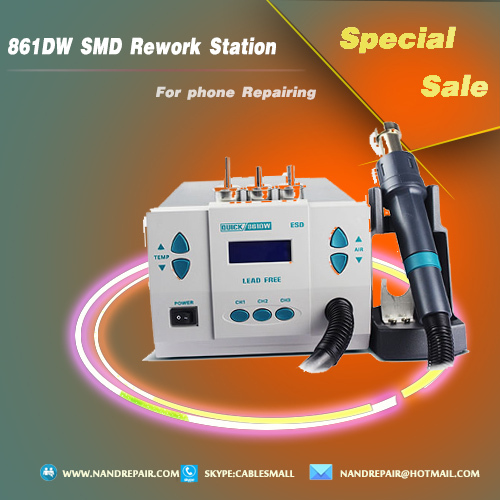 Quick 861DW SMD Rework System is an indispensable tool in phone repair industry. Quick 861DW is exclusively designed for reworking and soldering SMD component. Nandrepair plan to Spend approximately 2-3 working days discussing 861DW SMD Rework station Instruction Manual.Please carefully read this manual before operating the unit. Store this manual in a safe, easily accessible place for future reference. 1. Use the unit only in the described manners as the manual. 2. The air outlet and its surrounding area maybe very hot. Please take great care and not to be burned. 3. After work, the handle must be placed on the holder and never place the handle on the workbench or other places. The unite can be turned off only after it cools below 100 ℃(sleepig mode) automatically. 4. Please keep the air outlet clear and not be blocked. 5. Do not place the sharp object besides or on the tube. 6. Keep the air outlet at least 2mm from the object. 7. Select the appropriate nozzle according to demands. differences in temperature may exist when different nozzle is used. 8. Turn off the power switch if not using in a period of time. Disconnect the pwer cord when not in use for a long time. 9. Handle with care not to shock the unit sharply. 10. A periodically maintenance of the unit if necessary. 11. Don't operate the unite with wet hand or when the power cord is damp to avoid short circuit or electric shock. 12. Never use this unit in flammable gases or near other flammable materials, After using, don't put it near the flammable gases or materials. 13. Some areas such as behind walls, ceilings, floors, and other panels may contain flammable materials which may not be found, the ignition of these materials could result in property damage and injury to persons, When working in these locations, move the handle back and forth and not pause at on point for protecting the flammable materials from ignition and other things from damage. 14. Children can't recognize the damger of the electrical appliance and keep the unit out of reach from children. Today, we will only explain about Quick 861DW Safety Instruction, If you are interested in it, you can check more info on product details, If you want to get more about Quick 861DW user manual, please do pay attention to nandrepair's News update tomorrow. see you tomorrow!